UPDATED: Fri., March 23, 2018, 10:16 p.m.
LOS ANGELES – Johnathan Williams leaned as far back from the table of microphones as the moderator would let him. His gaze didn’t leave the table until a reporter uttered his name, asking him if he could reflect on his final season playing for Gonzaga. The redshirt senior leaned forward just enough for the microphone to find his voice. “I’m proud of the guys,” Williams said. 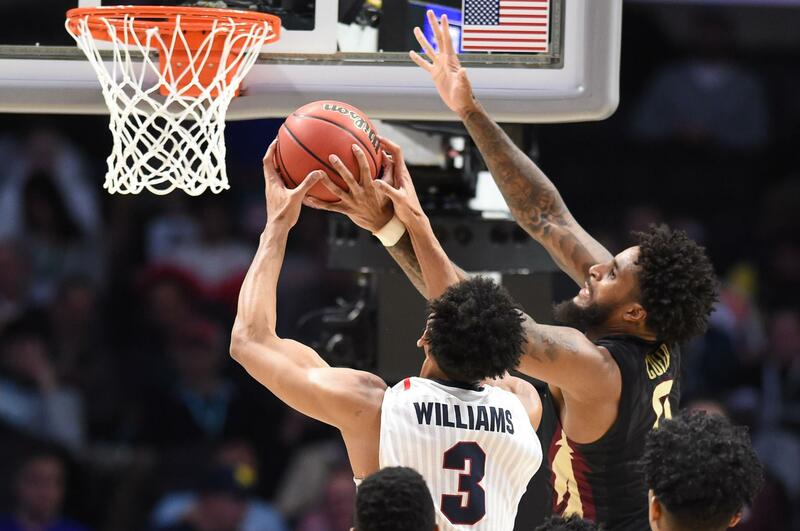 His solemn demeanor was draining the room of any leftover excitement from the moments leading up to Gonzaga’s heartbreaking 75-60 loss to Florida State in the Sweet 16 on Thursday. But through the sorrow, Williams remembered a season that so many thought the Zags were incapable of this year. He didn’t smile, but others in the room did. For those who have never had the pleasure of talking to the big man himself, Williams was one of Gonzaga’s gentle giants. He was the quietest of the bunch, humble, always attributing his success in The Kennel to other teammates, and always offering a positive outlook to every rough situation. It was hard to find the silver lining to Thursday’s situation. Williams had a tough night against FSU’s zone that made it difficult for him to finish at the rim. He ended the night with eight points on 3-of-7 shooting and a team-high 11 rebounds in 34 minutes. The following day, Williams shook off the disappointment from the loss and went to Instagram to post a photo that seemed to embody his outlook of the entire season. The photo that captured a kind of bliss that is often hidden in the locker rooms just after blow outs or hard-fought games – Williams is smiling in the direction of Silas Melson, whose head was caught in the forefront of the photo. In the background are Jeremy Jones and Rui Hachimura. Jones is laughing and looking back at Melson, reacting to whatever Melson had said to make Williams’ smile so wide. Williams had a shorter journey at Gonzaga than most. He had two years of availability in a Zags jersey after transferring from Missouri at the start of the 2015-2016 season. This season, Williams stepped in as Gonzaga’s top big man under the rim after the Zags lost Przemek Karnowski to graduation. Ahead of Thursday, Williams led five Zags in double-figure scoring this season with 13.6 points, shooting 56.6 percent from the field. His length and athleticism made him a threat inside against the majority of opposing teams, especially on the defensive end. He led the team with 8.4 rebounds and 40 blocks heading into the Sweet 16. This year, Williams combined his stats from Missouri and the Zags to reach the 1,000-point mark and the 1,000-rebound mark, the second Zag to hit both in program history. Published: March 22, 2018, 11:37 p.m. Updated: March 23, 2018, 10:16 p.m.